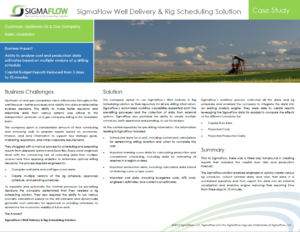 SigmaFlow’s Well Delivery and Rig Scheduling Solution is an integrated, streamlined approach to managing the Well Lifecycle and improving the efficiency of key processes, such as scheduling, operations, and reporting. We recently sat down with one of our Upstream Oil and Gas customers drilling in the Anadarko Basin to learn more about the impact that leveraging the SigmaFlow solution has had on their business. By using SigmaFlow as their central data repository and utilizing automation capabilities for tasks that were previously performed manually, this SigmaFlow customer was able to easily compare and analyze data to optimize their drilling schedule and significantly reduce their reporting turnaround time. Prior to SigmaFlow, the company spent a considerable amount of time scheduling and reviewing wells to prepare reports based on economic, finance, and land information to support key strategic goals, marketing, expirations, and other corporate requirements. Compare well data and well type curve data. Create multiple versions of the rig schedule, approved schedule, and pending schedules. The company opted to use SigmaFlow’s Well Delivery & Rig Scheduling solution as their central repository for all pre-drilling information. SigmaFlow’s automated workflow capabilities expedited both the pre-drilling processes and the collection of data from external systems. SigmaFlow also provided the ability to create multiple schedules, both approved and pending, to use for analysis. The SigmaFlow solution enabled engineers to quickly create various rig schedules, collect external data, and store that data in a centralized repository and then export the data into an external visualization and analytics engine reducing their reporting time from three days to just ten minutes. 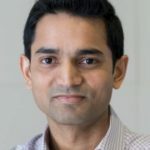 Vasu joined SigmaFlow in August of 2013 and has over 19 years of Product Management, Software Architecture and Product Development experience.